Sikuliaq floats in the Menominee River just after launch. Photo by Dan Bross, KUAC – Fairbanks. A new exhibit opens at the University of Alaska Museum of the North over the weekend. 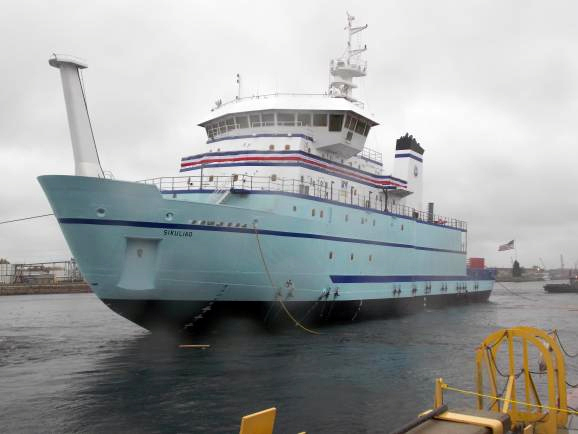 The year-long installation is called “Arctic Odyssey: Voyages of the R/V Sikuliaq.” It offers a first-hand look the University of Alaska Fairbanks’ state-of-the-art new research vessel, slated to sail in Arctic waters next year. Andres Lopez stands at a small table. He arranges four wooden blocks in a row. One of the blocks is tall and cylindrical, another is short and rectangular. “The idea here is that you can use these blocks to simulate some sort of profile of the ocean bottom…” he said. Lopez is the Curator of Fish at the Museum. He’s also the Guest Curator of a new exhibit showcasing the University of Alaska, Fairbanks’ new ice-capable Research Vessel, the Sikuliaq. A screen displays a squiggly, green line. It’s an outline of the tops of each block. This is supposed to simulate how scientists map the ocean floor. It’s the kind of work that will take place on board the Sikuliaq. Once the ship sets sail, researchers on board will start to collect all kinds of data for National Science Foundation-funded projects. On another screen across the room, there’s a map of the world. “You can see a summary of the information we have on different aspects of the ocean,” Lopez said. Push a button and the display changes from a map of the varying ages of the sea floor, to a display about ocean currents. Press the button and different colors indicate varying ocean water temperatures. Press another button and watch the annual growth and retreat of sea ice. There’s also a virtual tour of the ship. A console with buttons and another screen is set up so that visitors can navigate their way around the ship. Roger Topp is the Head of Exhibits and Digital Media Production at the Museum. He modeled the tour after a video game. “Arctic Odyssey” isn’t the kind of exhibit that offers wall hangings and specimens locked away in cases. In fact, its hands-on approach stands out for UAF School of Fisheries and Ocean Sciences Dean Mike Castellini. Visitors can examine samples scientist like the ones scientists might gather from places where the Sikuliaq will eventually sail. “It’s soft, it kind of looks like grass,” Katrina Manta said, sliding a round dish filled with polar bear fur under the microscope. But not like green grass, the hair is shiny and yellowish-white. Behind us, stands a six-foot, scaled model of the Sikuliaq on display. The ship itself is 261 feet long and it can sail through sea ice up to two-and-a-half feet thick. It’s the only vessel of its kind in the United States research fleet. It’s currently sitting in Lake Michigan shipyard in Wisconsin, where the electronics among other systems are undergoing testing. Mike Castellini says it could be sea-worthy by the end of the month. Eventually the Sikuliaq will sail through the Panama Canal in to the Pacific Ocean and then North to Alaska, stopping in California, Hawaii and Guam, before it pulls into the harbor in Seward next January. The museum’s special exhibit will be open until next April – right around the same time the ship is scheduled to undergo ice-breaking performance tests in the Bering Sea.